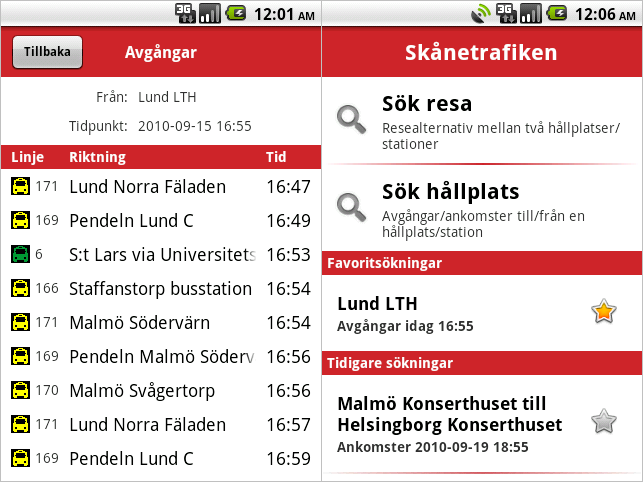 Android application to search trips and time tables for Skånetrafiken's trains and busses. See the web page, Lokaltrafik Skåne (Skånetrafiken for Android), for more information and screenshots. Figure 1: Two screenshots of Lokaltrafik Skåne showing the welcome activity to the right and departures from a certain station to the left. Faster and easier graphical interface. Save trips and stations as favourites. Finds nearby stations using GPS. Access to Google Android Market. Search for "lokaltrafik" on Android Market.